​The "Originality Tool"... AKA plagiarism checker! When a teacher creates the assignment they get to chose whether or not to use this tool under the Submission Type section. Check the box for "Enable VeriCite Submissions" Then click on "Advanced VeriCite Settings" for more options. In the drop down I would chose "Immediately" but there are other options. Pros - might encourage students to use quotes properly. Cons - Might encourage students to put everything in "quotes". Suggestions - un-check it and let Vericite find it Watch for students using "quotes"
Pros - check student work again self. In the case of repeated assignments or just turning in work already completed. Cons - perhaps it is okay to turn in similar work or the same assignment again. Suggestions - un-check it and let Vericite work. 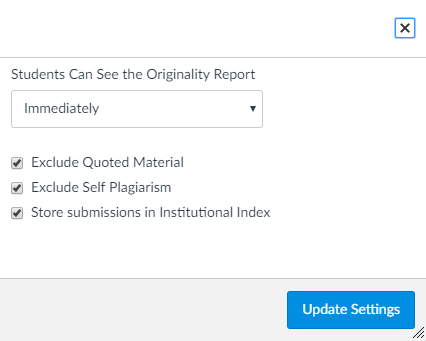 "Store submission in Institutional Index"
This same box appears in the Canvas Gades as well. The image on the right and below was 100% copied from ANOTHER student! There are other options in all the windows BUT I am NOT documenting that here! Here is a copied "paper" and links to the sources. We were concerned that says only 83% when we copied the whole document! But do not rely on the % given - actually look at the document. The % scores might be useless on assignments where you are asking students about historical or documented works. BUT again think of the "Quote option" while creating the assignment. USE it. To build the school/district database again siblings/friends! USE it. To let the kids know there are tools for them and you to help with writing. - We did not see a way to HELP students as they type or work on their paper. It only gives results to similar or copied websites afterwards BUT they can use that info to their learning advantage. Maybe an update will happen! - We did NOT see an option to use VeriCite under Quizzes. It is only for "Assignments".